Mithras' rockbirth from the Aquincum Mithraeum – Mithraeum. Our Common Sun. Birth of Mithras from Mithraeum of Victorinus, Aquincum. — Photo: A. Pegler. Limestone relief (H 0.98. Br 0.55) depicting Mithras' rockbirth. Mithras, naked and emerging from the rock to mid-thigh, holds a burning torch in his upraised left hand and a dagger in his right. 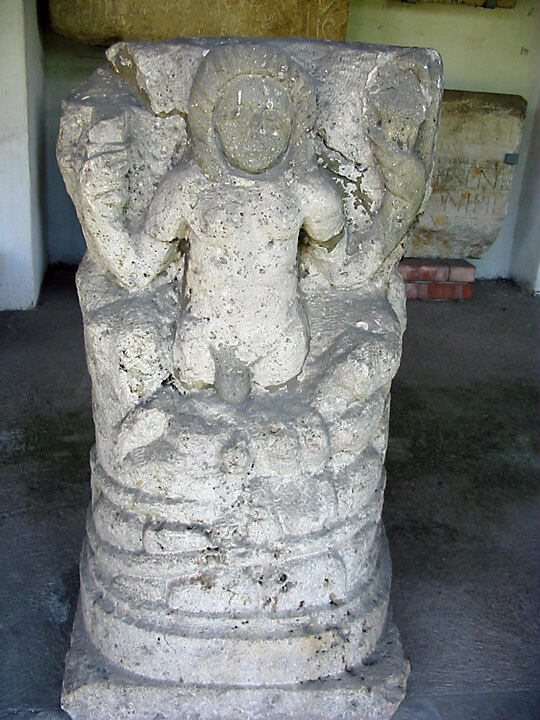 The rock is surrounded by a serpent who raises its head towards the god.